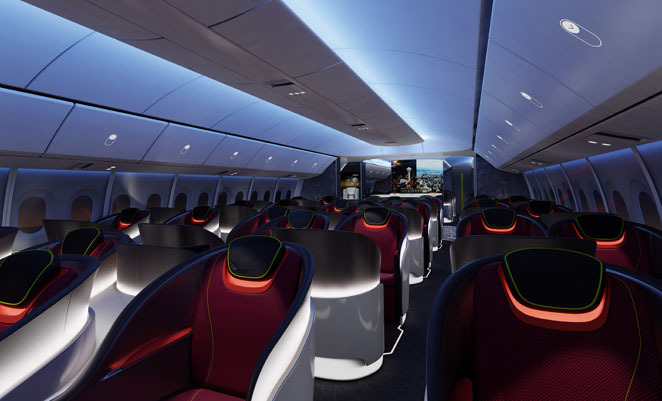 Boeing has used the 2014 Farnborough Airshow to reveal new details about the cabin designs and amenities it will offer on the new 777X models which are due to enter service from 2020. Boeing says it has applied designs it developed for the 787 line to the new 777, including a 6,000 foot cabin pressure altitude, 15 per cent larger and higher-positioned windows, and all new interior designs. The new interior design will be customisable by airlines, including overhead panels and stowage bins, and cabin dividers. LED lighting and higher levels of cabin air filtration will be standard, and cabin noise will be reduced by the new GE9X engines nacelle designs and higher bypass ratios. 777X’s to replace Qantas 747’s! I thought the better pressurisation on the 787 was something they could only do with carbon fibre? How are they doing it on an aluminium 777X?